Following our visit from a reporter and a photographer we are on page 3 of the Lincolnshire Echo today! Also on their website so you can read it here, causing some discussion too with comments left already! The BEBA event with electric bikes at the House of Lords last Tuesday has sparked interest from the local press. A reporter and photographer from the Lincolnshire Echo have been to the Batribike showroom this afternoon to interview me about the event at the House of Lords and to see the Bikes. Photos were taken in the showroom and they also got pictures of Steve riding the Diamond outside. Look out for the resulting editorial in the Lincolnshire Echo on Monday! We are delighted to see that they have said "Good value, decent weight and good range"
Batribike attended the Electric Bike Day that was held by BEBA (The British Electric Bicycle Association) at the House of Lords yesterday. The event was hosted by Lord Laird who introduced several influential speakers from diverging backgrounds such as the DfT, the Bicycle Library and the City Police Bike Squad. 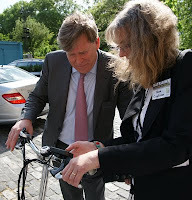 MP's, transport planners and other influential guests had the opportunity to test ride electric bikes in the courtyard and in Black Rod's Garden. We were delighted to demonstrate our Quartz folding electric bike to Simon Burns MP, Minister of State at the Department of Health. We received this e-mail from Mr and Mrs H today and we are delighted to share their comments. We purchased 2 Quartz 2011 model bikes from Locks of Sandwich, Kent in early January this year. We just wanted to say how good they are and we are amazed how many miles per charge can be achieved. We haven't yet found a hill too steep to go up, even with just using the motor. I've seen some rather dismissive blogs about the power of Batribikes, but can assure you that these bikes do MORE than they say on the tin! The build quality is good, the lights bright and they fold up and down in seconds. Seat big and comfortable as well. Please feel free to use this email in any reviews or blogs as we want other people to try them out.